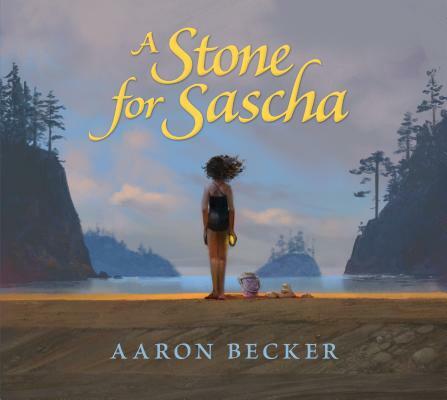 A STONE FOR SASCHA written and illustrated by Aaron Becker, is the wordless story of a girl trying to process the death of her dog. Initially, at least. Lushly illustrated in digital pastels, it soon expands to take on time and history and cosmology and the interconnectedness of things. After laying her beloved dog to rest, a girl finds peace with a smooth stone that has traveled the world through the ages, in this wordless picture book by Becker...Readers will be enticed to explore this book's beautiful, dreamlike pictures, and the message of healing will comfort many who have known loss. Memorable and moving. In contrast to the watercolors of his Journey series, Becker uses digitally manipulated pastel strokes to give his spreads a thick, supersaturated feel. Yet, as in his previous work, the satisfaction flows from enchanting views of action that unfolds in fanciful scenes that range across time and cultures. Remnants of ancient history, readers will realize, may lie very close at hand, and, Becker suggests, perhaps nothing is ever truly lost. The parade of civilizations rising and falling into ruin allows Becker to depict a range of architectural styles and costumes, creating the sort of arresting panoramas introduced in the “Journey” trilogy...Combining a sensitive story line with high adventure and dramatic settings, this will inspire a variety of readers to envision histories of their own found objects. Becker’s wordless picture book, with its large, evocative digital illustrations, shows a story that begins with heartbreak...Through the centuries, what was originally a large golden sphere is greatly reduced in size yet still serves an important purpose: to help ameliorate a young girl’s grief over the loss of her beloved pet. This circular, layered tale is marked by Becker’s sumptuous, cinematic spreads. Even more epic than his Journey trilogy (Journey, rev. 9/13, and sequels), this is a story that provides new details and new understandings with multiple viewings. The book asks us to reflect on the strings that bind us to each other, across great spans of time and space, to consider where we can locate solace in a time of loss, and how comfort can be found in unexpected places. This wordless picture book, with Becker's emotional, haunting paintings, invites children to wonder and to perhaps discover "their own epic story." In thrilling pictures, eons unfold as we see the stone changing form with the rising and falling of civilizations: It is an obelisk, a building block, a keystone, a carved dragon and, eventually, a glowing stone for Sascha.